Scholarly workflows benefit from data standardization. Country Codes – ISO 3166 – A standardized list of country codes leveraged to eliminate errors or inconsistencies in location entry. Unicode – ISO 10646– Unicode enables standardized storage of non-roman diacritic text characters (such as Japanese characters or mathematical symbols). Our systems are fully Unicode compliant. Digital Object Identifiers (DOIs) – DOIs are sometimes described as “Social Security Numbers for Articles.” At an appropriate point in the workflow, DOIs are registered with Crossref for resolution to appropriate URL(s). Open Researcher and Contributor Identifiers (ORCIDs) – ORCIDs are sometimes described as “DOIs for people.” Using the orcid.org application programming interface, workflow participants are unambiguously identified using authenticated ORCIDs. ORCID authentication may also be used to provide single sign on across multiple systems. Whether a user chooses to log in with their ORCID or not, our system allows ORCIDs to be fetched directly from orcid.org for association with author name records within EM. 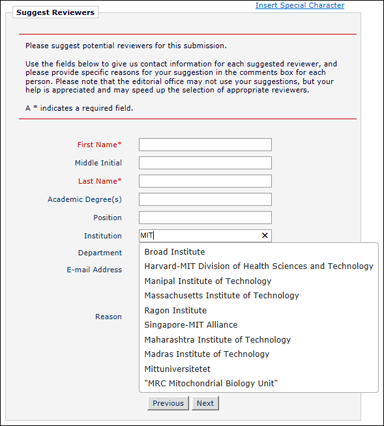 Ringgold – Ringgold Identifiers are used to unambiguously identify institutional affiliation of workflow participants such as authors and reviewers. This is critical for mapping editorial activity to a publisher’s subscriber records and for developing Open Access business models that rely on precise institutional affiliation. Open Funder Registry – The Open Funder Registry (formerly FundRef) is a list of funding organizations maintained by the Crossref organization. 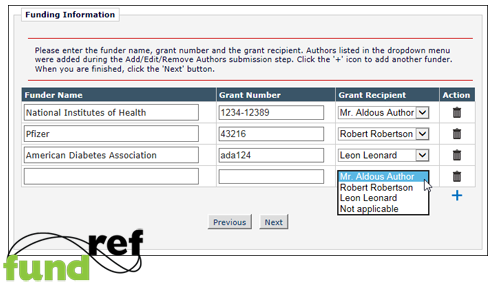 By mapping Open Funder Registry grant number identifiers during manuscript submission, publishers can manage and measure funder obligations and enhance discoverability on publication platforms. Similarly, funding bodies gain increased visibility into research funding publication outcomes. JATS – Journal Article Tag Suite (JATS) from the National Library of Medicine is an XML standard for the storage and exchange of manuscript metadata. It has been broadly adopted by publishers and vendors in all disciplines. JATS is an application of NISO Z39.96. Aries software supports out-of-the-box export and ingest of XML manuscript metadata in JATS format. CRediT – The work of Project CRediT originated at a May 2012 workshop, co-hosted by the Wellcome Trust and Harvard University, which brought together those interested in exploring contributorship and attribution models. This meeting spawned a working group charged with developing a controlled vocabulary of roles that could be used to describe typical research “contributions”. The group tested its draft taxonomy with corresponding authors publishing across science disciplines. The outcomes of the pilot test are described in this Nature commentary (April 2014). The Project CRediT taxonomy consists of the following 14 contribution types to scholarly work, along with guidelines on how these roles may be assigned. The CRediT taxonomy is integrated with Editorial Manager version 13.0.